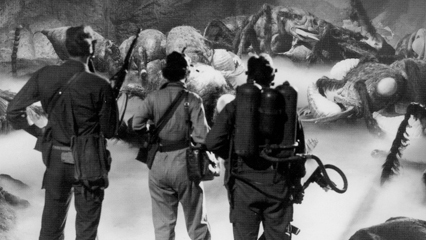 For the Vegas locals out there, don’t forget that tonight is the Cinevegas screening of 1954’s colossal killer ant classic, Them!. Join me at the mock drive-in, set up just off the Fremont St Experience. The Neonopolis garage is probably the best place to park for the night. Tickets are on sale at the Cinevegas Box Office at the Palms, and the screening is expected to sell out. Unfortunately, there’s no way to get these tickets online, but there will be shuttle service from the Palms to the screening location.